We are learning about germs, and unfortunately germs are invisible. Since kids this age are so concrete, I wanted to give them a way to “see” the germs. First we used hand lotion to give the glitter something to stick to. 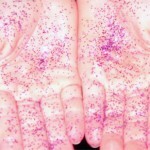 Then I sprinkled glitter on the kid’s lotioned hands. I had them do some of the things they would normally do on an average day. Like turning on a light, or scrathing their nose. They were able to see how the glitter rubbed off onto the lightswitch. C was in the shower when we started, so she played ring around the rosie with my other two kids when she came out and we saw how the glitter transferred onto her hands also. After this experiment everyone felt that they understood germs more completely. The kids were motivated to run around the house sanitizing all the lightswitches, doorknobs, remote controls, and keyboards. This activity is part of our Germs Unit. Thanks Jennifer for creating it for us! Check out Jennifer’s blog for other learning activities. What a great idea and simple enough that I may actually try it. Thanks. I love this!!!!! This is an awesome idea. Thanks so much for sharing! I’d forgotten about this idea! I so need to do it with my kids, because they’re really not getting why they need to wash their hands. This is awesome! We’ll try this since we just read about germs! | Wow! This could be one particular of the most beneficial blogs We’ve ever arrive across on this subject. Actually Fantastic. I’m also a specialist in this topic so I can understand your effort.